Jellyfish lake and Milky Way are Palau's top non-dive locations, and for good reasons. Both these locations offer an experience unlike anywhere else in the world due to Palau's unique geology and formation of the Rock Islands. We also visit Long Beach; a sandbank attaching two distant islands. The Milky Way is a light blue, white clay-bottomed grove in which you apply the clay to your body, acting as a natural exfoliant. Long Beach extends the length of two distant islands and is best visible at low tide. Regardless, you can walk out far into the ocean on a sand bed rising from the waters. About 90km north of Koror, explore Palau's "last remaining paradise", the Kayangel atoll. Snorkel in the outstanding clear ocean, relax on the glittering white sand of Ngerebelas islet beach, and walk around the peaceful Kayangel Island. * Pregnant women and children under 5 years cannot join this tour. * Tour may be canceled or change due to oceanic conditions. * A changing room is available. Please bring change of clothes. Snorkel all day and visit Palau's largest long beach! The northernmost tip of Babeldaob island is a naturally preserved site where one can snorkel to witness Palau's beautiful and diverse underwater world . 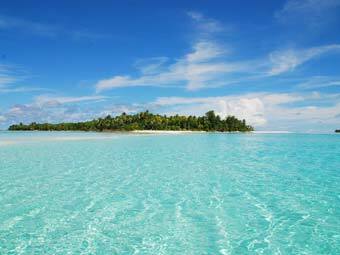 We will also visit the largest long beach in Palau. Recommended for those who want to relax in the morning and join an activity in the afternoon. Enjoy lunch at a restaurant with a nice ocean view. Later we will visit the snorkeling points to see colorful fish and corals. Choose from a variety of glass bottom boat tours where you can get a clear and full view of Palau's underwater life without having to set foot in it. No need to worry about currents, or rain and this cruise enjoyable from small children to the wise and elderly. The boat has a tidy, comfortable setting with a bathroom and makes for an interesting experience to view Palau's waters. An excellent day outdoors for the whole family. Our guides will educate you on the many natural wonders you encounter throughout the day and bring you to some of Palau's most enchanting locations. * Pregnant women and children under 2 cannot join this tour. Kayak through the world heritage Rock Islands as our tour guides will give a detailed explanation on animals and plants of Palau. This half day tour is recommended for those who want to relax and have their free time in the afternoon. 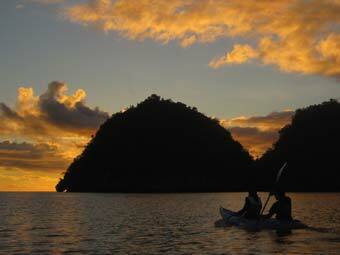 Explore Rock Islands in the dusk by kayaking, and then snorkel in the water, alive with bioluminescence after dark. Calm waters and quiet atmosphere with no machinery sounds makes the experience one of a kind. Kayaking that travels through mangroves, and tranquil waters out to an open lagoon. A very peaceful way to associate with the calmness and abundant wildlife that makes an appearance at night in Palau. The sounds, the stillness, the moon and the stars and the guidance will make this tour a good, lasting memory.